March 2016 #ELLEdTech Chat: Google: Do You Love It, Hate It, or Ignore It? Is Google evil or just everywhere? I remember when the company introduced its search engine. Up until then, I had used Yahoo, or Yahooligans with my younger students. AskJeeves was also great because kids could just type a regular question into the search bar and not worry about using key words or Boolean logic. Then, not long after that, a colleague told me about Google’s search engine and I decided I had to check it out. It took only a short while to get used to it and once I did, I was converted and have never looked back. But Google is so much more than a search engine. I used several programs in my teaching: I used Sketch Up with a few of my 8th grade boys, but I didn’t really know what to do with it in my ESL Social Studies classes so that didn’t get very far. I used Google Translate to communicate with the parents of some of my students. I liked Google Earth and used it a fair amount in my teaching even though it was very slow to load. Outside of teaching, I used to use Google Maps but now I’ve gone back to MapQuest because I don’t like the new version. Obviously, I also use Blogger – and have been using it since before it was acquired by Google. I’m not really an early adopter so it took a while but eventually I created a Gmail account, too. Of course, YouTube also gets a pretty good amount of my attention, too! You can read about the history of Google and when various programs began here; I thought it was interesting to see how the company has evolved. Why am I bothering to relate all this history? Because the second #ELLEdChat is all about using Google Apps for Education! But I have to confess that for various reasons, which I’ll try to go into during the chat session, I didn’t use them very much. So I am really looking forward to learning more how educators today incorporate them into their teaching. On the other hand, Laurah, my co-host from TPT store Tools for Teachers by Laurah J, is a Google Certified Education Trainer so I’m sure she will have lots of great ideas. 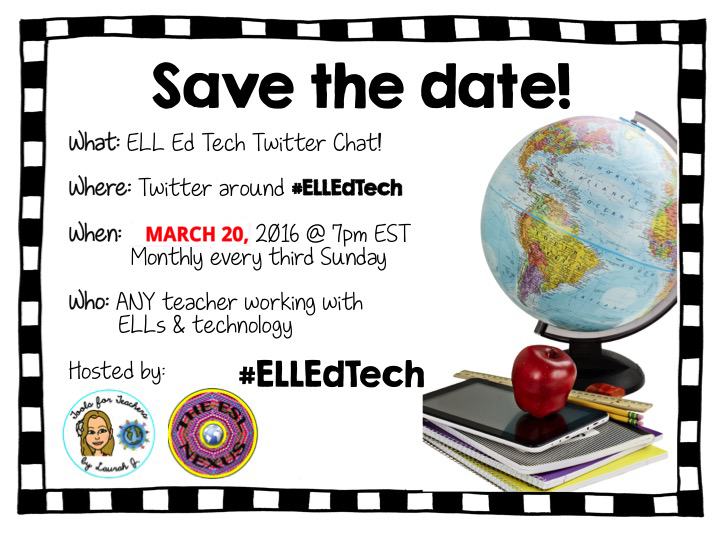 Join us on March 20th for the 2nd #ELLEdTech Twitter chat! 4. Starting at 7:05, @ESOL_Odyssey or @The_ESL_Nexus will post questions every 8 minutes using Q1, Q2, Q3, etc. to identify the questions and the hashtag #ELLEdTech. 6. When responding to someone, please be sure to "mention" them by including their Twitter handle. You are welcome to let any of your teacher friends who might be interested in joining us know about this Twitter chat. We can't wait to chat with you on Sunday evening! Can't make it to the chat? Check out the archives to see what you missed!